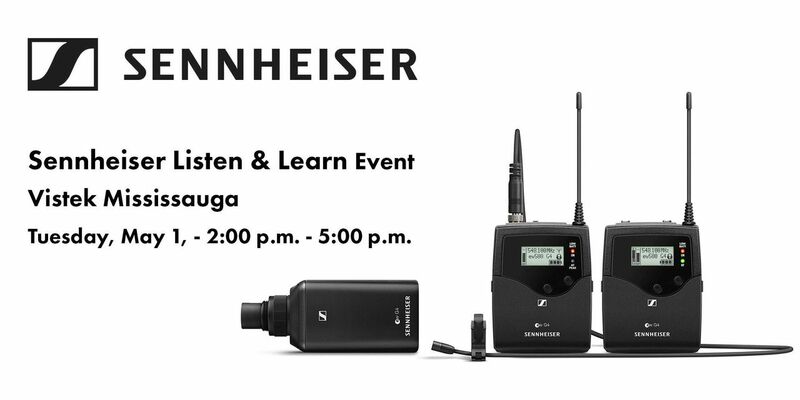 Come and join us on Tuesday May 1st, from 2:00 p.m. – 5:00 p.m. for our post NAB Show Sennheiser Listen & Learn event at Vistek Mississauga. At our Sennheiser Listen & Learn event, we’ll be showing the brand new Evolution Wireless G4 100 and 500 series portable sets alongside a sneak peek at some other new innovative Sennheiser products. With 600MHz sell off in the US now finalized certain channel bands of wireless transmitters will be retired, come find out about what’s to come in Canada and how it will affect you. You can pre-order your new G4 series wireless now and apply the trade-up offer when it ships in early May. As you know Sennheiser also offers its popular digital wireless AVX system as an alternative to the Evolution series and as well Sennheiser offers a range of wired type microphones and headsets. At this event you will have the opportunity to listen to, and hear the differences between the various mics and systems as we demonstrate and help you to decide, what is the best solution for you! Other topics will include immersive sound and live demos of the new Ambeo Smart Headset. New Ambeo Smart Headset (ASH) along with a wide selection of Sennheiser wired mics and headsets. Bonus: Event participants are also eligible for the event free prizes draw, or take advantage of Special Trade-up and/or 1 day only special, in store only, Sennheiser discount offers available in all Vistek stores on May 1st only! Also, Effective May 1st, Sennheiser and Vistek will also be running a Trade in / Trade up program. Turn your old wireless trash into treasure. Give us your old transmitter and receiver from any manufacturer in any frequency and will give you a rebate up to $250 towards the purchase of any new Sennheiser Wireless.